“How extremely stupid not to have thought of that!” was Thomas Henry Huxley’s reflection on reading Darwin’s Origin of Species. What might elicit such a reaction from a contemporary biologist? Today the question is answered by David P. Mindell. Currently Program Director in Systematics and Biodiversity Science at the National Science Foundation, and formerly Dean of Science at the California Academy of Sciences and Professor of Ecology and Evolutionary Biology at the University of Michigan, Ann Arbor, Mindell is the author of The Evolving World (2006). My objective here is to describe a few Thomas Henry Huxley moments I’ve had. 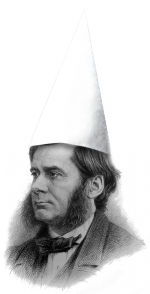 Huxley’s original moment happened when, as the story goes, he said, “How extremely stupid of me not to have thought of that!” after reading Darwin’s On the Origin of Species. Because I am particularly interested in the systematics of birds, I’ll recount similar sentiments when considering biological classification and taxonomy. Linnaeus began describing and organizing life’s species about 300 years ago. In his 1758 book Systema Naturae, he described a whopping total of 10,000 or so species. That’s roughly 0.6% of today’s 1.7 million described species. Linnaeus placed each of his 10,000 species into five nested and named categories or ranks: species, genus, family, class, and kingdom, based on his impressive accumulated wisdom. He said his lifetime’s work was a way of praising and better understanding God, though I suppose the project had its own satisfactions. Organizing life is a rather heroic task. Working collaboratively with students and correspondents, he immersed himself in study of the wondrous, poorly known details of living creatures from across the globe, and hunted for patterns of similarity and discontinuity among them. He then arranged those species and higher-level categories, guided largely by his own sensibilities and taste. But sensibility and taste, no matter how well informed by study, are personal. And that is the root of what had been a long-standing question for biologists. Is there a non-arbitrary, natural order for classifying life’s diversity? If so, how can we discover and implement it? But before getting to that, let’s consider why taxonomy matters in the first place. One way to put it is that organismal taxonomy is a fundamental component of scientific discourse. You can’t discuss much biology without the names of species or other groups or organisms. Imagine trying to communicate, much less mitigate, the recent Ebola outbreak in West Africa without names and detailed descriptions for viruses, fruit bats, gorillas, chimps or humans. Similarly, try understanding how ecosystems work without knowing the names and traits of their diverse organisms. Taxonomy also matters because the resulting classifications are structured to convey useful knowledge, or at least they should be. For example, the alphanumeric Dewey Decimal Classification used by many libraries tells you about the similarity of books’ subjects as well as their locations on the shelves. Traditionally, organismal classifications conveyed information about the relative similarity and dissimilarity among species. Birds all have feathers, and are all placed together in one otherwise exclusive group, comprising a class of vertebrates (Aves). Mammals, reptiles, and amphibians also comprise vertebrate classes. But why? What knowledge is conveyed? Is there an objective criterion for establishing a vertebrate class? Not really. Snakes and crocodilians are also distinct among vertebrates, but none have been raised to the level of class. Nor have other flying animals, such as bats, pterosaurs, and various insects, warranted a class-level ranking. The same unpredictability characterizes demarcation of all taxonomic ranks; this is one of the arbitrary aspects of taxonomy I mentioned earlier. For most groups, taxonomic ranks were first created and populated with species by earlier generations of taxonomists, based on their personal views of degrees of similarity across various traits and their eclectic biological interests. In 1992, Kevin deQueiroz and Jacques Gauthier published a beautiful synthesis in Annual Review of Ecology and Systematics. It helped catalyze the community’s efforts to upgrade the centuries-old, pre-Darwinian practices of taxonomy, infusing them with knowledge of evolutionary biology. In a nutshell, the idea was, and is, to base classifications on phylogenetic relationships, and to name taxa that correspond to monophyletic groups (clades). These include all and only the descendants from a particular node within an evolutionary tree. Phylogeny then provides the explicit, objective and natural structure for classification. It seems painfully obvious now. In 1999, John Avise and Glenn Johns published a paper in Proceedings of the National Academy of Sciences, demonstrating how to make taxonomic rankings objective as well. They used fossil-based estimates of absolute ages for clades to standardize their taxonomic ranking. That is, clades or taxa of the same rank should be roughly similar in age. This is both objective and useful. It yields taxonomic ranks whose species and species attributes can be meaningfully compared in studies of evolutionary rate and process across very different organismal groups. Using age to rank lineages replaces personal and inconsistent rankings with the universal metric of time. Both of these papers crystallized ideas that had been percolating through the community and the literature for many years. Willi Hennig had proposed phylogenetic taxonomy and use of “geologic age” in denoting taxonomic ranks in the 1950s, and Charles Sibley and Jon Ahlquist applied the general approach to birds in the late 1980s, but the methods and data available then were underdeveloped and overlooked. However, as a beginning investigator in the 1990s, the two timely syntheses mentioned above each had me channeling Huxley: “Of course; why didn’t I put these ideas together!” They can provide objective standards for biological classification, across all life forms. But wait: this is taxonomy we’re talking about. There is still plenty of disagreement on best practices. The ideal of biological classification reflecting phylogeny is broadly embraced. But how and even whether to standardize taxonomic ranks remains controversial. Some prefer traditional ranks as familiar and indicating degrees of similarity and discontinuity. Others prefer waiting to make changes until phylogenies and time calibrations improve. Still others see ranks as troublesome and unnecessary, noting that evolutionary comparisons can be made between sister clades, as equal in age, regardless of rank. Taxonomic traditions vary across groups of organisms, and can be quite slow to change. However, I think the way forward is increasingly clear—it’s just a matter of phylogeny and time. One more thing: this ideal approach is more easily applied to animals, fungi, and plants than to bacteria, archaea, and viruses, where transfer of genes among distant relatives is common. But that’s another story.